Beautiful hand made jewelry featuring your flowers taken from wedding, funeral, anniversary or any special occasion. You choose between a pendent, rosary or rosary bracelet. These pieces are specially designed and hand made by Doris. Years of experience and love go into each unique piece. 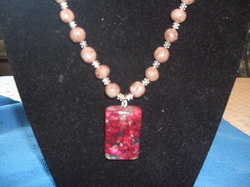 This piece is made with carnation flowers and polymer clay the pendant is made with crushed flowers in acrylic. It is part of my private collection but a similar one can be made from your flowers from any special occasion you wish to remember. You mail me your flowers and I design a piece especially for you. Only $25.00 To order yours or for more information contact me via email. 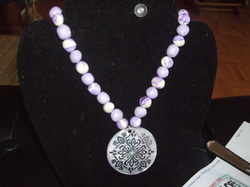 Please contact Doris to purchase a one of a kind piece!